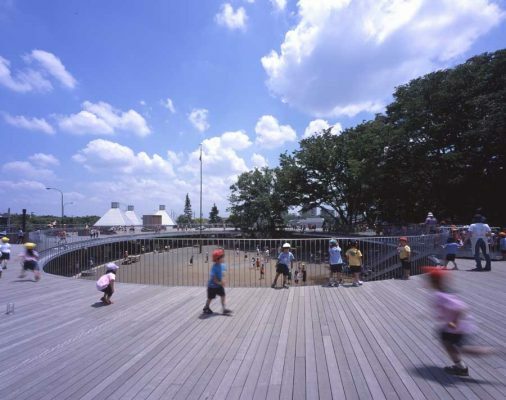 The request from the kindergarten directors was extremely simple in content: “we want you to make a Roof House for five hundred kindergarten pupils.” We had been introduced by Kashiwa Sato, a creative director who loves the Roof House. The Roof House is a work we completed in 2001. Even now, the family eats together up on the roof. The Roof House has caused debate on its pros and cons. Has the roof been really used during hot summers and cold winters? The answer is YES. 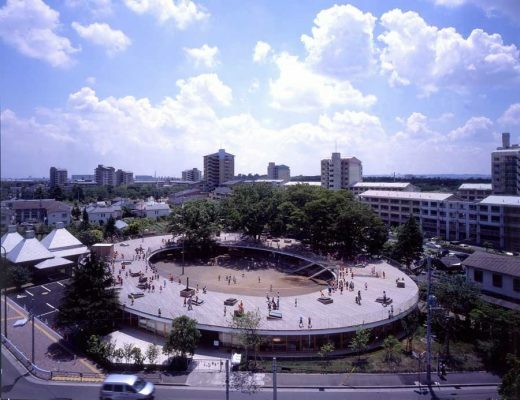 The husband and wife team that run the Fuji Kindergarten understood this roof without a single word of explanation. Nor was it necessary to explain the power of understanding of Kashiwa Sato, who had introduced us to the kindergarten directors. At the climax of the initial meeting, we conferred at the Roof House. Although it was originally just an inspection visit, having gone up onto the roof, somehow no one wanted to go home. Whether Mr. and Mrs. Takahashi (the owners of the Roof House) became involved, or whether the other couple involved them, unconsciously there was a deepening feeling of familial solidarity, however slight. We don’t think this is due to it being a gathering of people with similar hobbies and preferences. Discussion was unnecessary. The Roof House told us everything. “In summer the roof is hot, so we go out in the morning and evening. In winter the roof is cold, so the afternoon is good.” These comments from Mr. and Mrs. Takahashi, owners of the Roof House, penetrated to the essence of the architecture. This time, our team understood perfectly. The Roof House is the mother of the kindergarten. The kindergarten directors then became worried that if it were to be the same as it is now, these architects wouldn’t take on the job of reconstructing it, and so they politely began to inform us about places where the roof leaked. Finally, they told us, “the children in this kindergarten are good at putting buckets under the leaks in the roof.” We loved this kindergarten building that we had to destroy. The wide garden was also good. The shadows of the large zelkova trees were also good. If it were to be reconstructed, we vowed to not lose this goodness. That doesn’t mean that the oval shape emerged easily. It was a shame that the existing kindergarten building was not connected in a loop. We absolutely wanted to make a space without dead ends, but as we were obstructed by three large zelkova trees, it just couldn’t become circular. Riding the train on the Chuo Line one day, we suddenly drew an oval that avoided the trees, and seeing how much better it was, we used it unchanged as the shape. 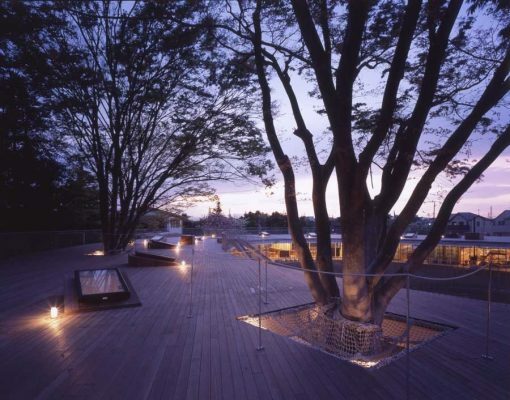 Voices of concern were raised by the team with regard to building while preserving the large trees, all three of them inside the building, but they were overcome by the allure of a space without dead ends. In this kindergarten, there are no distinctions between the colleagues. 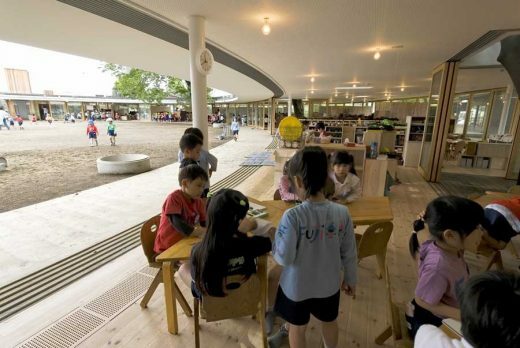 For better or worse, rooms at the ends of a building unavoidably tend to be segregated from the others, but in this kindergarten building there are no hidden places. The place designated as the directors’ office is a corner at one side of the entry hall. Rather than a directors’ office, it is merely a directors’ corner. The directors are also the security guards. Basically, the problems that have been occurring in schools over recent years, including bullying, are created by the presence of hidden rooms. What occurs in closed spaces is unknown. The children have no refuge. Teachers and pupils in closed spaces don’t know what is occurring in the adjacent spaces. The spaces in this kindergarten building are in full view of each other. There are no walls in this kindergarten. There are just piles of paulownia wood blocks to indicate the area of each class. Because there are no walls, sounds are also transmitted between spaces. The sounds are not blocked by the acoustic absorption material on the ceiling. The rooms are only divided by casually stacked-up furniture, like building blocks. If you scramble up onto this furniture, the neighboring classes can be seen. The problem of inaccessible rooms does not arise here. If a problem occurs in a classroom somewhere, help will soon come from a nearby room. With no hidden rooms, children will automatically adopt socially acceptable behavior patterns. It’s also no problem to go to an adjacent classroom for a moment. According to the directors, spaces with a lot of noise are better for raising children who have the ability to concentrate. If you think about it, children don’t study in their rooms. Children study in noisy kitchens. Junior high school students go to the library to study, but the library is by no means a tranquil space. People can recognize the voices of others even in the bustle of Shibuya. A peaceful, sympathetic space is perhaps an abnormal condition that doesn’t originally exist in society. The original boxes that partition the interior of the building were invented by “Jyo Gakkai,” a student organization at the Musashi Institute of Technology. Three years ago, over a period of only three days and nights, they produced five hundred boxes for a campus festival. There was no money, so they made really crude constructions using MDF that still had a strong smell of headache-inducing adhesive, but it was a great success. Although these are merely boxes, they allow innumerable children to gather. The children like the fact that there are no requirements. Even if we offer to help, these children running about will very diligently pile up the boxes. Even with no requirements, they will try to get into the narrow spaces. If you give orders, children won’t work, but in reality they like to work. With luck, most of the standout pupils here will one day belong to our studio at the university. Based on our impressions of the effectiveness of this idea, we decided to collaborate with the students even more than before. Paulownia wood was used as the material. It was Mr. Hirano that introduced Kashiwa Sato to the kindergarten directors. That was, so to speak, the starting point of this project. Although paulownia has an expensive image, we were told that this could be done at a low price. Because we used soft paulownia, even if the kindergarten pupils bang their heads slightly, it will be the paulownia that gets dented. The corners were given a 5mm radius. The basic module of the box is 300×300×300. This was developed into variations of 300×450×300, 300×600×300, and 600×600×600. That’s because fitting all of the kindergarten’s teaching materials into the same-sized box would be inconvenient. The outer forms of the boxes are arranged with these modules. The basic idea of the box is a building block. The paulownia can be easily lifted, even by a light kindergarten pupil. The thickness of the boards has been increased in accordance with the span, and even if the children jump on them or hit them, they are sufficiently strong to prevent problems. Basically, even if an adult gets on, they will be safe. Having completed the boxes, the children were gathered into what we labeled a workshop, in which we were told that it would be good if the boxes remained free. The empty boxes were divided into two classrooms and handed over to the kindergarten pupils. The result was like piranha fish in the Amazon River. The kindergarten pupils crammed themselves into the stacked boxes, piling up in an immense uproar. The result was a success, but these boxes were intended for the use of the teachers, and essentially shouldn’t be used by the kindergarten pupils. In places where the excessively vigorous kindergarten pupils dragged them out, the door hinges were pulled off. The boxes themselves were robust, but the doors needed further study. Holes were inserted in the centers of the box faces, and places for bolts to be installed were etched on the inner faces. If this was all left entirely free, it would still be unstable during an earthquake, so consideration was given to stiffening braces where necessary. 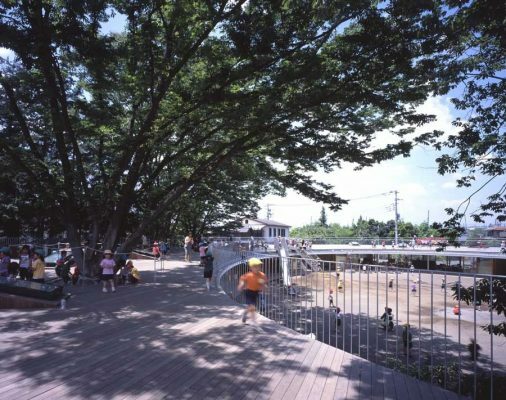 Boards of pure paulownia have been used for those walls that are unavoidable in the kindergarten rooms. These are interposed between the paulownia boxes and stabilized with bolts. It is possible for even the kindergarten teachers to easily demount the bolts. The image of the washroom in a nursery room is that of an outdoor well. We want the kindergarten pupils to casually chat around these wells. Even having installed so-called walled washbasins, there are no walls in this kindergarten. Besides, rather than washing one’s hands while facing a wall, we decided it was more fun for everyone to gather together, cheering and shouting. The waterspout faucet is a molded flexible tube. Inside as well as outside the sink, you can freely turn to your friends, and we were worried about disasters, but unexpectedly the children understand. At present, it is being happily used without any trouble. The lighting is naked light bulbs. Although naked light bulbs do not provide the brightness of fluorescent lamps, this teaches children the way light is made. Strings for turning on the lights hang inside the rooms. However, even if one is pulled, it is only attached to the few lights surrounding the string. To turn on all the lights in a room, it is necessary to go to each place and pull the strings. There are no partitions in the rooms, so naturally there are no walls in which to place the switches, and no walls to divide the lighting areas. Children gather in the places where the lights are turned on, creating a local place. A light dimmer function is included in the switch for each light. Although the purpose is to extend the longevity of each lamp, another purpose is to allow the children to visually check the filaments of the light bulbs that have become extinguished. Children who graduate from Fuji Kindergarten will know why lamps shine. They will also know the relationship between a lamp and a switch.